Justification for pay equity legislation has been provided by the wage gap that exists between male and female workers in the Ontario workforce. It has been estimated that this gap amounts to 36%; i.e., for every $1.00 that men earn; women only earn $0.64. In actual dollar figures, the average male worker in Ontario during 1987 earned $32,120; whereas the average female worker earned only $20,710. Legislation has therefore been introduced in an attempt to close this gap. 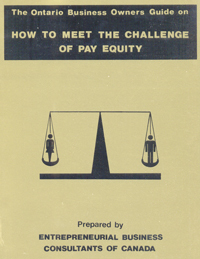 The Ontario Business Owners Guide on How to Meet the Challenge of Pay Equity prepared by Entrepreneurial Business Consultants of Canada; 260 pgs; ISBN 978-0-920847-12-1; softcover; published in 1989; Canadian: $49.95.